Based on dozens of incoming posts about “Now Download Your YouTube Videos Legally” for last two days, I’m so confused at the first sight. Since these Flash videos on YouTube are not streaming via Real Time Messaging Protocol like Hulu, we’re always downloading these videos into our browser cache when watching them online. So are these totally illegal? Certainly not. And copyright infringement happens only if the downloaded videos are reused as commerical, I guess. Then I read carefully about such advancement on YouTube offical announcement. LOL! The simple story is, now you can download your uploaded YouTube videos as MP4 files thru a button “Download MP4”. Holy crap, downloading your own uploaded videos is usually the right thing on earth. Jesus, it’s not legal or not. It’s just a free MPEG-4 video conversion feature provided by YouTube! Actually, the upside here is MP4 formats are widely accepted by iPod or most video players, so such free conversion is relatively useful. However, those “so-called illegal YouTube downloaders”, such as vixy.net, have better options for downloading our own videos. Some friends usually asked me about the copyright issues on YouTube videos. I donno. But just watching the videos on YouTube, whatever online streaming or downloading to local disk, is definitely legal as we’re free to see anything unknown. Right? 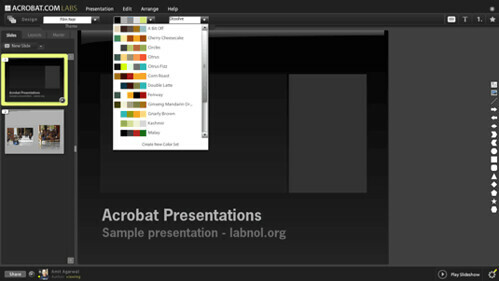 For Adobe’s newborn Online Presentations on Acrobat.com Labs, a lot of details could be read thru Digital Inspiration’s first look: “Adobe Introduces Acrobat.com Presentations – Create Impressive Slides Online“. I’m definitely late for this big mashup from Adobe. But when I found out the truth on the experimental product, “oh my god”, it was not what I expect. Last point, this toolkit just let you export slides as PDF? Oh, okay, it’s all about Acrobat. We know that now. More and more brilliant ideas are coming from our great Adobe Labs, but how about any serious evolution later? There is a famous PowerPoint called death by PowerPoint spread widely on the website. In this presentation, the author indicates that people do 30 presentations everyday but 50% of them are unbearable. Another data shows that in January 2008 alone, nearly 79 million users had made over 3 billion video views on YouTube, compared with PowerPoint presentation, video is easier for sharing and delivering. When searching news or information, we disposed to accept the videos because it is very concrete. But when we want to show our opinions we usually make a PowerPoint presentation because it is easier than making a video. There are 5 ways for you to convert your PowerPoint to video. 1. Using Wondershare PPT to Video to convert PowerPoint to video with animations, transitions, sounds, video clips retained in the output. 2. Using windows movie maker to create a PowerPoint video if there are no dynamic elements in your computer. 3. Log in the slideshare.com and create a PowerPoint video online. 4. 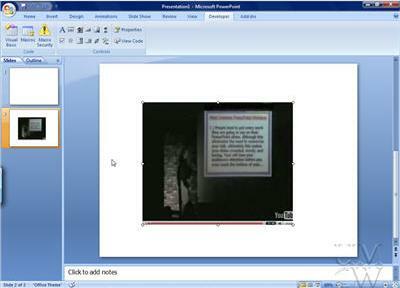 Using some screen recorder such as Camtasia to record your PowerPoint. 5. Make QuickTime movie on Mac. Now there are the details of these 5 methods. Rolling back to a year ago, right here I alleged that “Why Not Add YouTube Flash Video in Your Next PowerPoint Presentation“, as well as something more about rich media in presentation topics, such as “Best Practices for Playing and Controlling More in PowerPoint Presentations” or “Make Your Live Homepage in PowerPoint Slides. Maybe my old tips of YouTube video on PowerPoint is kinda obsolete now, and luckily Microsoft PowerPoint Team released its own illustrated tutorial on a blog post “How to insert that funny clip you found online“. Yeah, not late to learn more about this, as video sharing is still hot on the air. Certainly the core technologies on this is simple, if you know Developer tab and Controls in PowerPoint. Something new I got, is now we can embed and play 720p HD (High Definition) YouTube video. It’s still easy to catch up: add “&ap=%2526fmt%3D22” at the end of the URL of the video file, making it look like “http://www.youtube.com/v/zlfKdbWwruY&hl=en&fs=1&rel=0&ap=%2526fmt%3D22”. Enjoy our video sharing in every presentation! 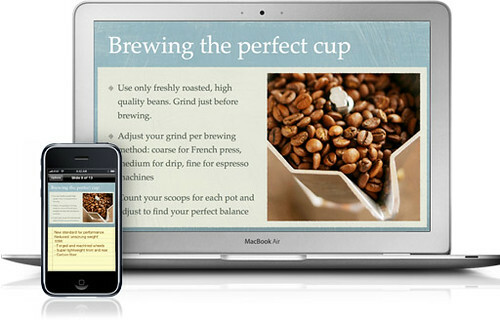 Keynote Remote lets you use your iPhone or iPod touch to control your presentation from anywhere in the room using Wi-Fi. See your slide with notes or both the current slide and the next slide in the palm of your hand. Just swipe to advance. All we need is a tiny app for iPhone called Keynote Remote (¢99 on App Store). Now your iPhone can control your Keynote slides by going previous/next slide remotely via Wi-Fi network. It’s really simple to use, and its Note mode is greatly handy to help presenters recall any keynote points when presenting. Such advanced feature is nice anyway, however, it could be better if the remote control is based on Bluetooth not Wi-Fi, as we know Wi-Fi is not easily available anywhere. Good luck! How many times have you seen terrible PowerPoint presentations that use those horrible fly-in animations along with the unbearable screeching tires sound effect? That’s not a presentation—that’s a disaster…. Highly recommended for any PowerPoint users. The author Aaron Stannard is community outreach manager at SmartDraw, the world’s most popular business graphics software. But this article is not a product promotion for their smart PowerPoint integration with fantastic graphics. He indicated that, the systematic misuse of PowerPoint’s capabilities caused that well-known “Death by PowerPoint” syndrome around the world. And using PowerPoint animation wisely could make presenters out of trouble. • Animation lets you present your ideas in a logical sequence, when done correctly. • Animation helps your audience relate to an idea by focusing their attention on one point of order at a time. • Animation builds up to your punch lines. We’re making a public show for our business advancement, so we shouldn’t make business presentation boring anyway. That’s my idea. PowerPoint 2007 offers a lot of surprises to us when she made her debut with ribbon coat and SmartArt accessories years ago, however, those tremendous changes lead a lot of problems, such as incompatibility. Since Office 14 is going its way from alpha to beta at Microsoft labs, my only expectation on potential PowerPoint 14 is the full-featured Web presentation. Among those leaked Office 14 “alpha” screenshots and new feature rumors, I can’t find too much information about our PowerPoint baby. 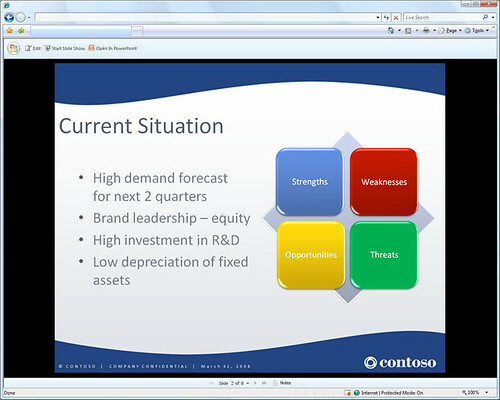 So how will Microsoft treat the leading presentation software in the world? Frankly speaking, Microsoft’s PowerPoint has changed little over the years, while competitor Apple’s Keynote coming with more improvements like “cinematic transitions”. 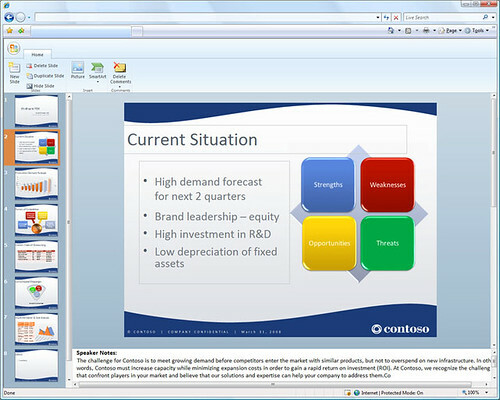 Right, SmartArt in PowerPoint 2007 is just sort of luxury accessories for a presentation. Microsoft should focus more classic elements like transitions, animations, since the ribbon and SmartArt are already well done. Hopefully Microsoft is working on kinda this, so no news about PowerPoint 14 yet. The selection of presentation software is important, because we can easily tell the difference between PowerPoint and Keynote presentations. Intriguingly Microsoft shows a little interest in Web apps recently, and we can see these Web PowerPoint fantasies from last PDC weeks ago. Get all elements done in online editing of Web PowerPoint, better than those free services online to reveal your power, okay? This is my another request on our estimated PowerPoint 14 to Microsoft. I’m not asking you to prepare a LOVE related presentation as your Valentine’s gift, unless your he/she is a completely geeky baby. But just think over this, the celebration of Valentine’s Day between lovers is kind of showtime of one’s heart, which could be described as a personal presentation about the love, and the relationship. All premium presentation skills could be applied on this project for the specified audience. This is not a lesson to teach how to improve your skills in love, but your presentations for Valentine’s Day would be one good impression anyway. Here are some ways on presentations for kinda love, although usually I don’t think E-Cards are one great way to express our ardor. Create and Send Greeting Cards with authorSTREAM! As the golden rule for preparing a presentation, “practice, practice, and practice” is an essential skill to everybody. And I agree that the more I practice, the better I get, because it’s never an easy job to demonstrate and explain something in front of different audience. Making a presentation involves public speaking, which can be seriously scary. Famously, speaking in public has been voted scarier than dying (which says something about its lack of popularity). So if we make enough practices before, the confidence and courage is fearless. Since we know the importance of practice, we should know more about our audience. I usually ask myself some questions in hehearsing, such as what’s the instant reaction from audience to my words. It’s easy to do a piece of research of those potential audience. Once I know some information about them, like genders, ages, or interests, I may add the considerations into my practice. Practice is an essential, not a rule on presentation skills. Knowing a little about audience is the tip of such a game in which audience and me are players. Then no scary anymore. Like what’s quoted in the book The Art of War on 6 century BC: “If you know others and know yourself, you will not be imperiled in a hundred battles“. Maybe it’s somewhat off-topic to discuss this old problem at the 3rd time, as Flash is just an old-fashioned tool for Web development. However, most multimedia animations in current Web sites are built on Flash technology, so what I’m talking about is Web enhancement on mobile devices. Nowadays those smartphones such as iPhone or BlackBerry provide us the better Web-based usabilities. If Java and Flash are perfectly supported on those devices, the mobile business could be boosted as an alternative to our desktops over Internet. Days ago, in an interview with Bloomberg at the Davos, Adobe chief Shantanu Narayen mentioned this issue. Since Flash Lite is too feature-limited, and standard Flash is kind of crash-maker, the balanced solution is not easy to implement. As an end user, I just want to surf the Internet on mobile as normal as I can do on any computer. 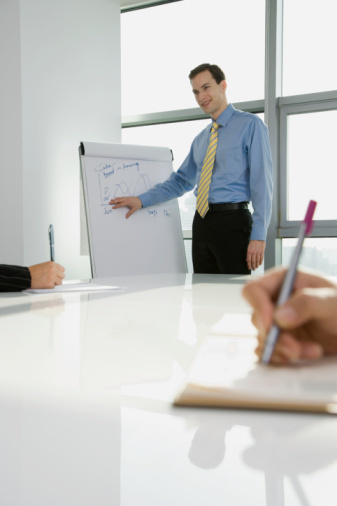 Would you like to improve your business presentations? Presentation veteran William Peterson provides best practices, discusses proven techniques and welcomes the open exchange of presentation ideas and experiences.